Okoawo BlueGate: On corruption: Adamawa State House of Assembly serves impeachment notice on Nyako. On corruption: Adamawa State House of Assembly serves impeachment notice on Nyako. In efforts to rid the country of corrupt leaders, the Adamawa State House of Assembly has commenced impeachment proceedings against the state governor, Murtala Nyako, and his deputy, Bala Ngilari. Moving the motion for the impeachment of Nyako, yesterday, the Deputy Speaker and the member representing Numan Constituency, Kwamoti Laori, said the governor had committed acts of gross misconduct in the performance of his duties as the governor of Adamawa State. Laori enumerated 26 grounds of financial misconduct by the Governor, among which is an alleged fraudulent award of contracts worth over N8 billion through SNECOU Group of Companies Limited, a company allegedly linked to one of his wives. Other charges against the governor include corrupt syphoning of N300 million public funds through a company, Hydro Source Resources Ltd in the name of constructing Mubi by-pass without mobilising to site or any construction carried out after the money was paid in full. He was also said to have grossly violated his oath of office by the ‘outrageous’ patronage and dominance of his family and friends in the discharge of government business at the MDG’s office, SPPU and Ministry of Health. Apart from this, Nyako also reportedly squandered N4,805,216,538.32 and N7,114,995,590.85 in 2012 and 2013, respectively, through the office of the Secretary to the State Government against budgetary approval. The governor was further accused of gross violation of Section 120 of the 1999 Constitution (as amended) through gross misappropria-tion and diversion of Internally Generated Revenue, IGR, for personal use to the detriment of the people of the state, among other charges. Reports of the impeachment move sent thousands of people into the street in protest. 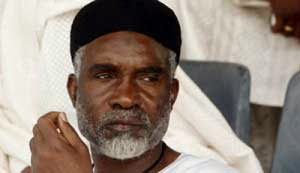 In 2008, Nyako was similarly served with an impeachment notice and has been having a running battle with the lawmakers since he left Peoples Democratic Party, PDP, for All Progressives Congress, APC. There had been tension in the state following last week’s order by the House for the arrest of four commissioners for their alleged failure to appear before the lawmakers to answer questions on the state’s finances earlier. The Deputy Speaker, Laori, who presided over the House last Thursday, directed the state Commissioner of Police to arrest the commissioners for Agriculture, Lucy Ishaku; Health, Lilian Stephen; Commerce, Ahmed Gorko; and Land and Survey, Abdulrahman Shuaibu who failed to show up and bring them before the house by 10 a.m. on Monday. The Assembly, which acknowledged receipt of a letter from the Secretary to the State Government, Kobis Thimnu, over his inability to honour the invitation, asked him to also appear unfailingly on Monday. The commissioner for Finance, Ibrahim Vokna, his counterpart for Works, Umaru Atiku, and the state Accountant General, Nasir Mohammed, had earlier appeared before the house. The Assembly had, on May 27, given Mr. Nyako and his government a three-day ultimatum to pay back alleged illegal deductions from workers’ salaries and allowances of May 2014. The development fuelled speculation in the state that the Assembly was bent on impeaching Nyako.